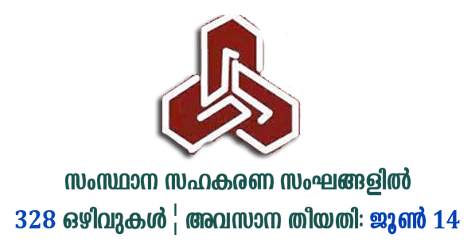 Kerala Co-operative Bank New Notification 2018 - 328 Junior Clerk, Branch Manager, Chief Accountant, Cashier, Secretary, Assistant Secretary vacancies. On 16/05/2018 Kerala Co-operative services examination board (CSEB Kerala) has released the new notification for recruitment to the post of 328 Junior Clerk, Branch Manager, Chief Accountant, Cashier, Secretary, Assistant Secretary vacancies. CSEB New Notification and Application Form can be downloaded from www.csebkerala.org. Eligible candidates may apply in the prescribed application format – Download CSEB Application Form on or before 14th June 2018, 5:00 PM. Kerala Co-operative Bank proposes to receive the application in Offline mode only. You should aware of all the process of 328 Junior Clerk, Branch Manager, Chief Accountant, Cashier, Secretary, Assistant Secretary vacancy Details, like Kerala Co-Operative Bank New Notification 2018 Eligibility criteria, Selection process, Age limit, Application process, Examination fees last date of application etc which are given below, The latest Kerala Co-Operative Bank New Notification 2018 Online Application link attached with this article. Selection is based on the rank list prepared on the performance of written test conducted by CSEB and Interview. CSEB Application Form and Chelan will be available from www.csebkerala.org. Candidates must apply through this prescribed application format. Candidates remit the application fee (refer fee details on notification) in any of the federal bank branches using the fee remittance Chelan from the website (or using Demand Draft). Candidates should send the filled application form, challan receipt / Demand Draft and self-attested copies of all required Certificates/Documents to the following address on or before 14th June 2018 (5.00 PM). The Secretary, Co-Operative Service Examination Board, Kerala State Co-Operative Bank Building, Over Bridge Jn., General Post Office, Thiruvananthapuram, 695001.